1. Are you in search for the ultimate cruise to Brazil from Miami? This 48 day expedition aboard the Oceania ship Marina will run you about $10,000/person, but travel is not measured by how much money you spend on vacation—it’s measured by how many vacations take your breath away. Diversification is the goal of this itinerary which includes several islands in the Caribbean like Cayman, Belize and Honduras. Central America stops are Costa Rica and Panama. Some South American ports of call are Ecuador, Peru, Chile, Argentina and disembarking in Rio De Janeiro. 2. The Crystal Symphony, a South American world-wind 13 day voyage sails to 6 different ports in Brazil starting in Rio de Janeiro. Additionally Punta del Este and Montevideo in Uruguay and Buenos Aires, Argentina are also part of the itinerary at a cost starting at $4,055/person. 3. MSC Orchestra is fine tuned to perfection with elegant décor, spacious cabins and international dining options are conducted by talented chefs. Passengers can enjoy this refined ship for under $1200/person and start their journey sailing from Rio making extended stops in Spain, Portugal, France and Italy on a 16 day trip. 4. Royal Caribbean generally attracts the Baby Boomer generation aboard their cruises to South America. Aboard Visions of the Sea, cruisers can get massages and treatments at the Vitality Spa and play games in the Casino Royale. Stops during this sailing will be in Brazil, Spain and Portugal. This sailing is priced under $1700/person. 5. Rio de Janeiro attractions are rainforest safari tours, visits to Christ the Redeemer or take an Amazon River boat tour when the Regent Seven Seas Mariner pulls into several ports of call— in Brazil, Uruguay and Argentina. Prices for inside cabins begin at $6,000/person. 6. The Holland America ms Veendam offers an exciting schedule of stops from Florida through the Panama Canal, Ecuador, Peru, Chile and Brazil starting at $5,000/person. Eco friendly shore excursions in ports of call are kayaking, waterfall tours and volcano tours which can be booked with the cruise liner. 7. Take a Brazilian adventure by booking a cabin on the Princess fleets’ Grand Princess. This ship cruises to Rio De Janeiro, through several Caribbean ports and Argentina on a 19 day sailing for $2,500/person. On days at sea, guests can visit the theater, pool, and bars and lounges on the ship. 8. Carnival Splendor has everything you look for in a relaxing vacation. There is 24 hour room service, a kid-free zone in the Serenity adult retreat, and yoga and Pilates in the fitness center. When you make it to ports of call throughout Brazil, Barbados and Grand Turk you’ll be fully energized and ready to enjoy the sites. Another highlight to this itinerary will be when the Splendor crosses the Equator. Expect this vacation voyage to average at $1,200/person. 9. The Seabourn Sojourn takes Brazil cruises to the next level as the ship was designed with luxury in mind. After enjoying your complimentary welcome aboard glass of champagne, you’ll set off on a 20 day voyage with over 10 different ports of call in Brazil, which include Rio de Janeiro and cruising along the Amazon River. Stops are also made in Uruguay and Argentina. Ocean view suites are priced at $8,700/person. 10. 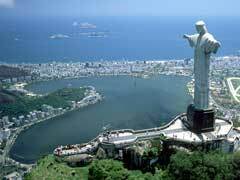 Azamara offers cruises to Rio de Janeiro at its best on the Azamara Quest. With all inclusive packages that offer first class accommodations, breathtaking views from balcony, pool and deck parties with live bands and cultural performances with traditional music it’s no wonder this ship is on the leader board. For nearly $2,300/person this 9 day cruise makes several stops in Brazil, Uruguay and Argentina. These are the best cruising has to offer, so take your pick and pack your suitcases. Get ready for an amazing vacation full of South American tradition.